Private view Thursday 11th April, 6 - 8 pm. Jack Bell Gallery is pleased to present a series of new paintings and sculptures by contemporary artist Baatarzorig Batjargal. In his third solo exhibition with the gallery, Batjargal draws on the techniques of Mongol Zurag painting to address the broader history of Mongolia’s development over the past century. The Zurag painting style emerged during the Mongolian independence movement in the early nineteen hundreds. Originally an art form to express the ideals of secular nationalism, today Batjargal has breathed new life into the medium. During a time of unprecedented urbanization, the artist addresses the contradictions of his own environment and its transformation from past to present. Panning through the repressions of Soviet style communism to the inequalities and consumerism of global capitalism, Batjargal offers narratives concerned with the loss of traditional heritage. In a rich tapestry of various regimes, the portraits in this series include gods, holy men, artists, intellectuals, warriors, noblemen, politicians and oligarchs. Batjargal was born in 1983 in Ulaanbaatar, Mongolia. 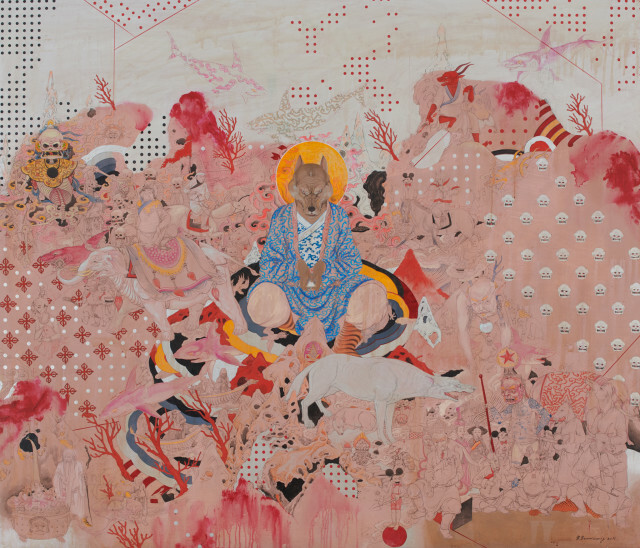 His work has been acquired by the Minneapolis Institute of Art, USA. He is a BA graduate from School of Fine Arts at the Mongolian University of Arts and Culture.